It’s simply known as the third Saturday in October. That date is owned by the famous rivalry; it’s even the title of a book about the game. Listed below are 5 things that you might not know about this rivalry. 1. The Tennessee game was the only one Coach Bear Bryant would celebrate with a victory cigar. The Crimson Tide had to discontinue this great tradition because the NCAA considers it a violation (What a surprise!!). 2. Coach Bear Bryant, during his own college years, actually played in the Alabama-Tennessee game with a broken leg. 3. The series has been noted for long winning streaks on each side, but 2 of Alabama’s longest streaks came in modern times. 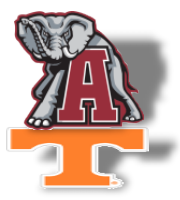 Alabama did not lose to Tennessee between 1970 and 1982, and then again from 1986 through 1994. Many believe those 2 long streaks contributed to the former Vols coach Phil Fulmer’s obsession with taking down the Alabama program that led to secretly taped conversations, secret witnesses, and reports to the NCAA. 4. Three kicks have served as the subject of Daniel Moore paintings: (1) The Phillip Doyle kick to win in 1990; (2) The Roman Harper hit that jarred the football loose from the UT running back and allowed the Alabama last second kick to win in 2005; and (3) Terrance Cody block of a kick as time expired, his second of the game, that saved Alabama’s magical undefeated season of 2009. 5. Coach Neyland of Tennessee once called an opponent’s head coach and told him to run the same offense that Alabama would be running against Neyland’s Volunteers later that year. When the coach refused, Neyland told the coach to ask his school’s president if he enjoyed the money they made from the Tennessee game. If the coach wanted to keep Tennessee on the schedule, they would run Alabama’s offense to help Tennessee get ready for the third Saturday in October. That coach did as he was told. These are just a few reasons why the Alabama-Tennessee game makes every list of college football’s greatest rivalries.